The Tarangire National Park in northern Tanzania offers some unrivalled elephant sightings - indeed, it is estimated that the Park is home to the largest elephant population in northern Tanzania. The seasonal Tarangire National Park covers 2,850 km² of area in northern Tanzania. It is the 6th largest National Park in Tanzania, and offers some unrivalled elephant sightings - indeed, it is estimated that the Park is home to the largest elephant population in northern Tanzania - approximately 2,500 - and these numbers are rapidly increasing by an estimated 6% per year. Some elephant herds can be as large as 600 strong. The Park takes its name from the Tarangire River that crosses through the Park, and which is the lifeblood for the wildlife that flock here during the dry season months (June to September), making these months splendid for game viewing. Huge herds of antelope, zebra, buffalo and wildebeest amass along the river banks and graze on the Park's fertile plains. When the short rains begin in November and December, the Park begins to sprout tender green shoots. The animals take full advantage of this, with many giving birth during the months of January through to March so that the young calves can get their nourishment from the now abundant supply of vegetation. In April, the long rains begin, and many of the grazing herds, now with their healthy young calves, migrate out of the Park towards Lake Manyara or further northwards, where there is greater choice of grazing land and water - only to return en-masse to the Tarangire River a few months later when their new-found water supplies begin to dry up. Not all the wildlife migrates away, however. Giraffe, waterbuck, impala, warthog, kudu, dik dik, pods of hippo and troops of baboons and vervet monkeys, and of course the elephants, all remain, along with the resident lion, spotted hyena, cheetah and leopard - and last but not least, the tree-climbing pythons. For birders, this is a true paradise - over 500 bird species have been recorded in Tarangire, including Kori bustards, storks, ostrich, sacred ibis, yellow-collared lovebirds, and colourful kingfishers, rollers and woodpeckers. 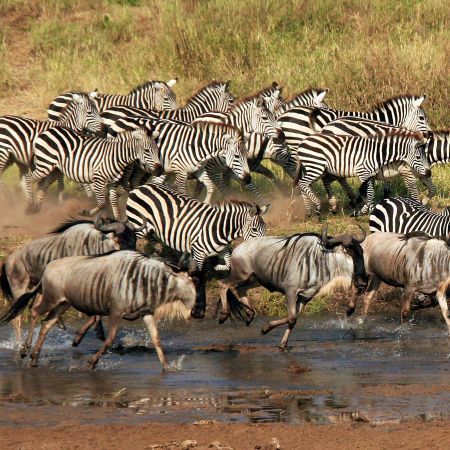 Many safari-goers choose Tarangire as a one or 2 night trip addition to their trip on their way to or from the Serengeti or Ngorongoro Crater, especially during the dry season months. The accommodation is in 16 classic canvas safari tents constructed on wooden platforms each with en-suite facilities as well as an outdoor shower, and a private veranda with views to the bush. All of this is topped with a thatched roof, complementing rather than intruding on the natural environment. There are 10 tented cottages (including 2 family rooms), all with en-suite bathrooms (with hot and cold running water), electricity and a verandah. The main guest areas include a bar with wonderful views of the floodplain and into the Park. 30 spacious tents are built on ample wooden decks, among them there are 2 units with 2 rooms interconnected, ideal for families with children. They all have en-suite facilities and a private veranda with 24 hours 220V electric lighting. Accommodation at Tarangire Safari Lodge is in either a traditional canvas safari tent or a stone bungalow, with all rooms having a direct valley view. The 35 tents are sturdy and comfortable - built on a solid base, with a thatched roof, screened windows with large curtains and en-suite bathrooms with solar heated showers. Guests are accomodated in 21 luxury safari rooms, all of which have either a kingsize or twin beds, en-suite facilities with hot and cold running water as well as a private deck. There are also family rooms sleeping 4 or 5 people.